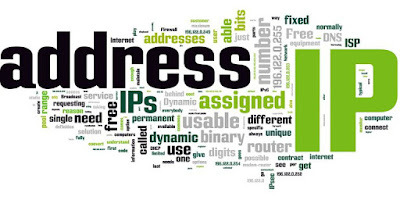 IP Address is the shorter way of saying “Internet Protocol Address”. It is a numeric identifier that is assigned to each machine on an IP network. It was introduced for use on the Internet, and it therefore makes sense to discuss it in this context. Although we use names in Internet when we seek information e.g. www.mynetworkinglabs.com because they are easier for us to remember, but computers does not understand names they communicate with each other on the basis of their numeric address that is assigned to them, thus computers translate these names into numerical addresses so they can send data to the right location. Public IP addresses are used to communicate in the Internet, while on the other hand the Private IP addresses are defined to be used by anyone without any global coordination. There are currently two different versions of IP addresses in use – IPv4 and IPv6, and they look quite different from one another. They are actually just long string of number, like 1736459382, but to make them easier to read, we write them in a special way. IPv4 addresses are written in the string of four numbers separated by dots [.] called Octet, where in each Octet we are allowed to write numbers between 0 and 255. A typical IPv4 address looks like this: 192.168.0.22. IPv6 addresses are considerably longer strings of numbers, so they are written in hexadecimal numbers that can be used to fit more information in fewer digits. There are 8 segments instead of 4 and colons are used to separate these segments in IPv6 instead of dots; for example 2001:0db8:0000:0000:0000:0000:0000:0053. You can ignore those segments containing zeros only by using two colons side by side. The sort version is written like 2001:0db8::53. This question might be in every ones mind, Well, according to the ICANN's publicly available documents IPv5 was an experimental protocol and was never used practically, but some of the concepts it developed have been incorporated in other protocols. There might also be a question that why every device needs an IP address? When connected to a network, your device needs to be identified and IP addresses are the numbers that identify devices connected to a network. If you need to access a local network only, then your device can be identified with an address that has only a local context. Which are called private IP addresses. But when you need to access services on other networks, then your devices needs to use a unique address. Which is known as Public IP address, while in some cases, this is done by translating a private address into a unique address (Public IP address) at the border between your network and your ISP’s network. This technology is known as Network Address Translation, or NAT, which we will discuss it in detail in our upcoming posts. How are IP addresses distributed? The IP addresses are distributed in a hierarchal system. 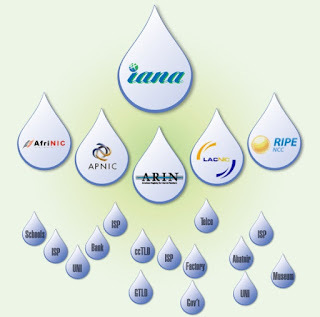 As a department of ICANN, the Internet Assigned Numbers Authority (IANA) is responsible to coordinate the allocation and distribution of IP addresses worldwide, by providing them to the five Regional Internet Registries. The RIRs then allocate smaller IP address blocks to ISPs and other network operators. From there, the ISPs and other Internet operators assign the addresses to the individual Internet connections you are probably accustomed to. The Five RIR’s are as follow.